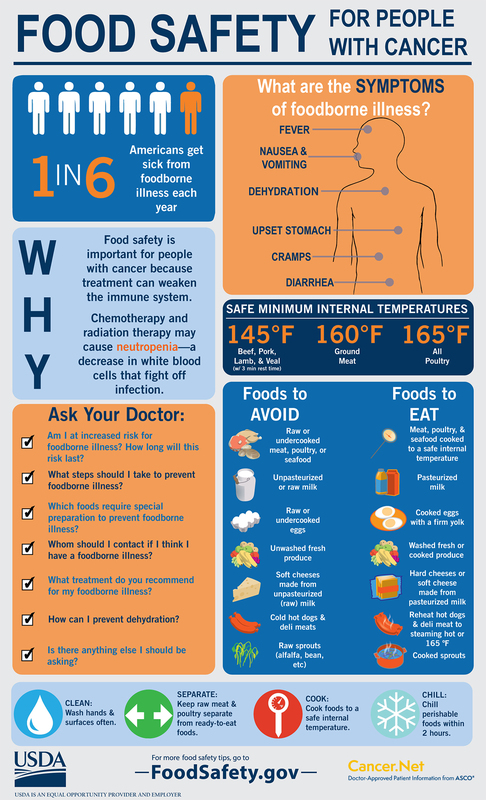 Food safety is important for all people, but especially during and after cancer treatment. Cancer and its treatments, such as chemotherapy, radiation therapy, and bone marrow/stem cell transplants, can weaken the immune system. This makes it harder for your body to protect itself from foodborne illness, also called food poisoning. Foodborne illness is caused by eating food contaminated with harmful bacteria, parasites, or viruses. The following tips can help lower your risk for food poisoning. Ask your health care team about any special steps you should take and for how long. Do not buy food stored or displayed in an unclean area. Do not buy bruised or damaged fruits or vegetables. Do not buy cans that have cracks, dents, or bulges. Pick up foods that can spoil at the end of your shopping trip and store them in a cooler on the way home. Rinse all fresh fruits and vegetables under running water, and dry them with a clean towel or paper towel. Clean the top of cans before opening them. After preparing food, wash your hands for 20 seconds with hot water and soap. Pay special attention to areas between fingers and under nails. Clean your utensils and dishes with hot water and soap. Disinfect your kitchen and cutting boards using 1 teaspoon of liquid, unscented bleach mixed into 1 quart of water. Keep raw meat, poultry, and fish or their juices away from other food. Bacteria can spread through contact with the food or its liquid, causing cross-contamination. Do not rinse raw meat or poultry because it can spread bacteria to nearby surfaces. Wash all items you used for preparing raw foods, including utensils, cutting board, and plates, before using them for other foods or cooked meat. Set aside a specific cutting board for preparing uncooked meat, fish, and chicken. Never use it for uncooked fruits, vegetables, or other ready-to-eat foods. Eat canned and packaged food before its expiration date. This is the “use by” or “best before” date on the package. Consume refrigerated leftovers within 3 to 4 days. After that time, throw it out. Even if the food does not smell or look spoiled, it may be unsafe. Some bacteria, such as Listeria, can grow even on foods stored in the refrigerator if they are kept for too long. At restaurants, avoid buffets and salad bars where food sits out for a long time and comes in contact with many people. Food can become contaminated when someone with a virus, often a norovirus, or another “bug” handles it. Put any leftover food in a “to-go” container yourself, rather than having the server do it. Refrigerate leftovers as soon as you get home. Choose restaurants that are clean and that are willing to prepare your food as you order it cooked. Use a food thermometer to check for a safe internal temperature of all poultry and meat. For instance, a hamburger should be cooked to at least medium (160˚F or 71˚C). Get a full list of recommended internal cooking temperatures on foodsafety.gov. Refrigerate or freeze perishable food within 2 hours of cooking or buying it (sooner in warm weather.) Proper cooking destroys bacteria, but they can still grow on cooked food that is left out too long. Food stored in the refrigerator should be kept at below 40˚F (4˚C). And, food stored in the freezer should be kept below 32˚F (0˚C). Thaw frozen food in the refrigerator rather than at room temperature. You can also thaw food in frequently changed cold water or in the microwave, but cook it as soon as it thaws. Cold hot dogs or deli lunch meat (cold cuts), including dry-cured, uncooked salami. Always cook or reheat these foods until they are steaming hot. Raw or undercooked shellfish, such as oysters. Sushi and sashimi, which often contain raw fish. Commercially frozen fish, especially those labeled “sushi-grade” or “sashimi-grade,” is safer than other fish, but check with your doctor before eating it. Some water sources, such as well water, may contain potentially harmful bacteria or chemicals. Community-supplied tap water is fine for healthy individuals, but it is not tested for safety for people with weakened immune systems. Use a water filter to remove spores and cysts, as well as trace organics and heavy metals, for food preparation and drinking. Ask your health care team for a suggestion on a filter you can afford. The time symptoms begin can vary widely. It may be within a few hours to 10 days after eating the tainted food. For some microbes, such as hepatitis A, it may be up to 6 weeks between exposure and symptoms. More commonly, people start feeling sick within the first couple of hours or days after infection. Call your doctor right away. Early treatment is important. Keep the suspected food or the food’s packaging materials, as your doctor may want it to be examined. If you became ill due to eating food at a restaurant or other public place, call your local health department. By reporting it, you may help prevent other people from getting sick. 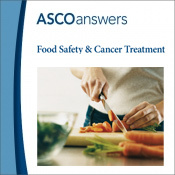 Download ASCO's free 1-page (front and back) fact sheet on Food Safety and Cancer Treatment as a printable PDF.